It is that time of year again, Parent Teacher Conferences! Conferences are a wonderful chance for a direct discussion with your child's teacher, but can be stressful from both sides. With these 10 tips, you will be ready for a stress free, successful conference. Your child's teacher often has slots for the conference times. The slots are often one after another, so if you are late, you will cut into your time as well as the next families. You are the most important influence in your child's life, so be ready to share with your child's teacher. This allows for strong communication and allows the teacher to understand when your child reacts differently to something in the classroom. People are often afraid to be "over-sharers" but it is often that information that helps the teacher the most. Communicate any changes, personality traits, habits, or anything else that may help the teacher understand your child. It is easy to slide back into how you were as a child. Try to look at things through your child's eyes, and react accordingly. 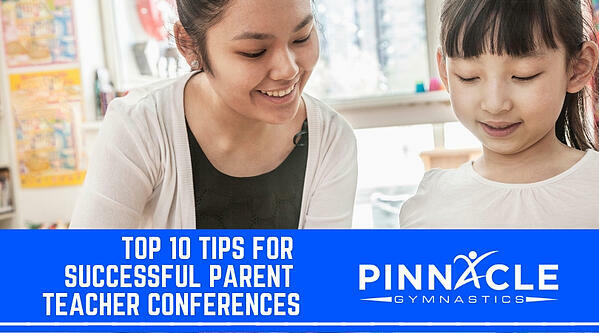 Conferences are often used to help the parent understand what is coming next in the classroom, so try to look at these events the way your child might and help prepare them accordingly. Write down your questions ahead of time. This will help keep things focused and help you leave the conference feeling informed and empowered. You may also use this time to alert the teacher of any upcoming absences or changes happening in your child's life. Try to enter the conference relax and with an open mind. As a teacher, I try to keep my conferences positive and discuss all your child has to offer. This allows for the parents to be more receptive to anything I would like to work on and helps them leave the conference on a positive note. While most of the conference will be about positive aspects of your child, be ready to hear a few things they may need to work on. Try to focus on what the teacher is saying and how it will help your child. Try to listen to everything the teacher is saying with an open mind, instead of how you are going to respond. Often, parents enter the conference with their guards up, which is a challenge for the teacher. Remember, the teacher is on your child's side and is trying to come up with the best solution for your child. If your child attends the conference, remember they are listening to everything being said. Children often interpret the things being said in a different way, so be ready with a follow up conversation with your child. Keep things positive and focus on what good things were said to your child. You may also want to follow up with your child's teacher afterwards with any concerns, away from your child. Conferences work best when there is regular discussion about your child. By attending each conference, you are able to stay up to date on your child's progress and allow your child's teacher to know the latest changes in your child's life. Conferences are an important part of building the communication and connection with your child's teacher, but it is not all of it. Make sure to continue to keep your child's teacher in the know about your child. A quick email is often the best way to help build the communication.